These are equally good for breakfast or dinner. 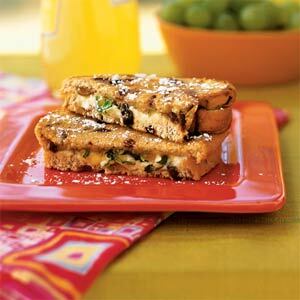 Mixing honey with the goat cheese makes it easier to spread over the cinnamon-raisin bread. Combine first 3 ingredients, stirring until well blended. Spread 1 tablespoon goat cheese mixture on each of 4 bread slices; top each slice with 1 1/2 teaspoons preserves and 1/2 teaspoon basil. Top with remaining bread slices. Lightly coat outside of bread with cooking spray. Heat a large nonstick skillet over medium heat. Add 2 sandwiches to pan. Place a cast-iron or heavy skillet on top of sandwiches; press gently to flatten. Cook 3 minutes on each side or until bread is lightly toasted (leave cast-iron skillet on sandwiches while they cook). Repeat with remaining sandwiches. Sprinkle with sugar.